Currently sitting atop the Billboard singles charts like a tiny six year old queen, Britains Got Talent nearly-winner and angel-voiced British Invasion '08 munchkin Connie Talbot is to get her very own Wii game. No, not for Xmas - for reals. 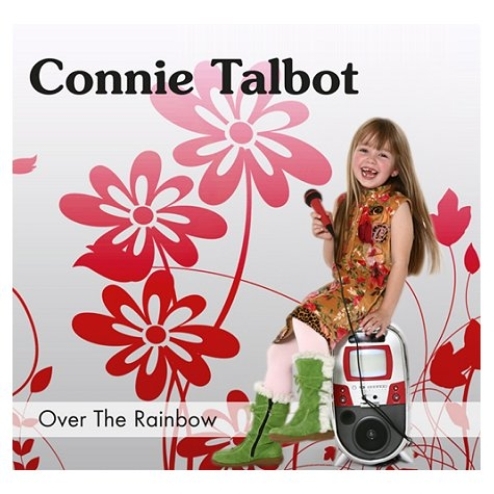 Connie Talbot: Over the Rainbow is some kind of musical karaoke game for the Nintendo Wii. Players will be able to sing along with Connie as well as.. do other stuff. It's unclear at this stage. As Kotaku's token Brit I feel I ought to take some responsibility for this but I am happy to pass this particular buck to the American public. You bought her cover version of Bob Marley's Three Little Birds, America - this whirlwind is yours to reap. No.1 Hot Single in the American Billboard Charts.....Nintendo Wii video game to follow this success..
December 2008, Stourbridge, England. Data Design Interactive - developers of the video game "Connie Talbot: Over the Rainbow" would like to congratulate Connie in breaking that most incredible barrier for British artists - the American Billboard charts - with her single 'Three Little Birds'. It charted at No1, knocking Coldplay off the top spot. The international stage now beckons for this young starlet who has had an astronomic rise to fame since featuring on the ITV "Britain's Got Talent" TV show. She has already appeared on major US TV shows such as Oprah Winfrey and Ellen, touching the hearts of all that hear her sing. This awareness in Connie has prompted an unprecedented demand for information about the soon to be released video game "Connie Talbot: Over the Rainbow" available on Nintendo Wii. The video game features 15 tracks, including stunning renditions of John Lennon's "Imagine", "Any Dream Will Do", "What a Wonderful World" and Bob Marley's reggae classic "Three Little Birds". Players will be able to sing along with Connie in the fantastic karaoke mode, or with other friends or family members in multiplayer fun. The public first met Connie in 2007 when she came 2nd in the Britains got talent show. Since then, Connie's popularity has grown - after success in the UK of her debut album 'Over The Rainbow', she stormed Asia going gold in four countries and Platinum in S Korea. European tours are underway, and a US deal is already under her belt - Connie is taking the world by storm! Connie takes everything in her stride. She has already claimed 2 World records (according to the Guinness Book of Records) for the youngest artist ever in the charts, and the youngest artist ever to receive a Gold disc. Data Design Interactive is part of Green Solutions Ltd (GSL) which manages the production of interactive products for the entertainment industry. From game design, development and publishing on PC and Console. GSL owns the popular MYTH MAKERS and KIDZ SPORTS brands and the publishing rights to the GODS development system. We control a number of studios which specialize in key areas. Data Design Interactive develops and publishes, and is a licensed publisher for Sony Playstation, Nintendo and Microsoft, Artworld Studios for computer animation and Advergaming is the market leader for in game advertising and custom games. Popcorn Arcade www.popcorn-arcade.com is the brand name for our family friendly, value priced Wii range.